Tomorrow is the reveal of the final room in my Chinoiserie Chic dollhouse, the living room. Like this living room by Mary McDonald, my living room has a very old Hollywood style. 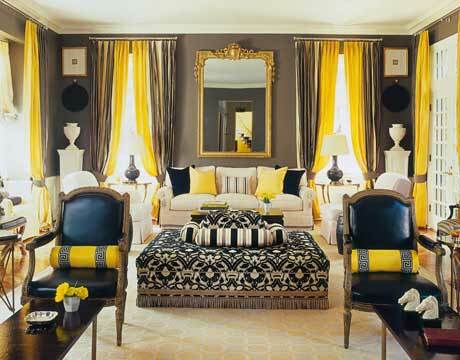 Both have a color palette of black, white, and yellow and the furniture placement is quite symmetrical, adding to the glamour and formality of the rooms. It is a room that I pulled out all the stops for, and I think you will love it. Cannot wait to see it! I bet its incredible! I am with Tina: bring it on!!! Saving the best for last! absolutely ahhhdore this livingroom image dahhling!